KGO Ranch and Tack, 26350 County Road 70, Gill, Colorado 80624. Phone: 720-879-1314, Email: [email protected], Website: www.KGOhorsehotel.com. Layovers Only. 10 stall barn, 6 pens, RV/LQ hookups, outdoor arena and round pen, tack store, lounge and bath with shower in barn, indoor wash rack. Hay and pine shavings for sale. Shower Stall, Box Stalls, Outdoor Arena, LQ Trailer Hookups (electric and/or water). WZ Ranch, Accommodating the Traveling Horseman, Tom and Phyllis Ellis, 2200 Twylby Road, Larkspur, CO 80118. Phone: 719-641-2300, email: [email protected], website: wzranchco.com. At WZ Ranch, we cater to horse transporters, traveling horsemen, trainers, and equine enthusiasts looking for a comprehensive layover and short-term boarding facility. Easy access on the I-25 corridor, easy off and on I-25 between Colorado Springs and Denver mid-way through Colorado. Discounted hotel rates at local Fairfield Inn and Suites. Our facilities are spacious, clean and horse safe with large 25’X25’ indoor stalls, 50’X50’ paddocks with loafing sheds and 12’X60’ indoor-outdoor runs as well as LQ trailer pads and hookups and 40 acres of weed free pastures. 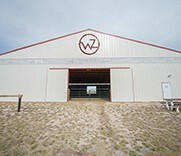 WZ Ranch also offers a 50’ round pen and 90’X140’ indoor arena with excellent footing for training, events, and riding activities year-round.